Most women would be thrilled shopping for clothes and shoes. These days, I feel the same when I visit the farmers market. I appreciate all the hard work that goes into growing the produce we consume. They might be priced a little bit more than the regular grocery store but, it gives me great satisfaction to meet the people who grow the produce. They are so cheerful, very generous and friendly. It is very relaxing to visit the farmers market every weekend and pick the veggies and fruits that my family and I enjoy for the rest of the week. This week, the peppers were the most colorful and worth adding to my basket. As a result for dinner tonight, we made stuffed peppers. The peppers are useful as they act as an edible bowl or pockets. The colors they come in make them absolutely appetizing and photogenic. 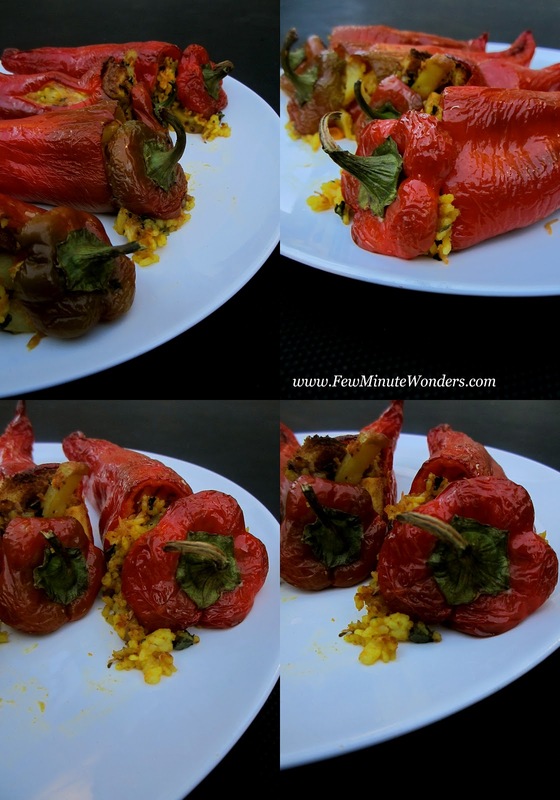 When it comes to stuffed peppers, there are a zillion recipes out there.The recipe that we came up with was with the leftover rice and sauteed veggies, toasted bread, cheese and cherry tomatoes. It was very simple using the leftovers as stuffings and baking them for 30 minutes. 1. Heat the frying pan. Add the sauteed veggies, cilantro and rice and give it a mix. 2. Add cherry tomatoes and bread to the rice and veggies. Remove from heat. 3. Cut the top of the peppers, remove the seeds from inside the peppers. 4. 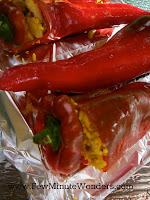 Add the cheese first as they will reach the narrow passage of the peppers easily. 5. Add some shredded cheese to the rice and give it a mix. 6. Stuff the peppers with this mix and cover the pepper with a lid. 7. Smear some oil in your palm and coat the pepper's skin and place on a lined baking sheet. 8. Bake for 30 minutes at 400 degrees F. Serve hot. 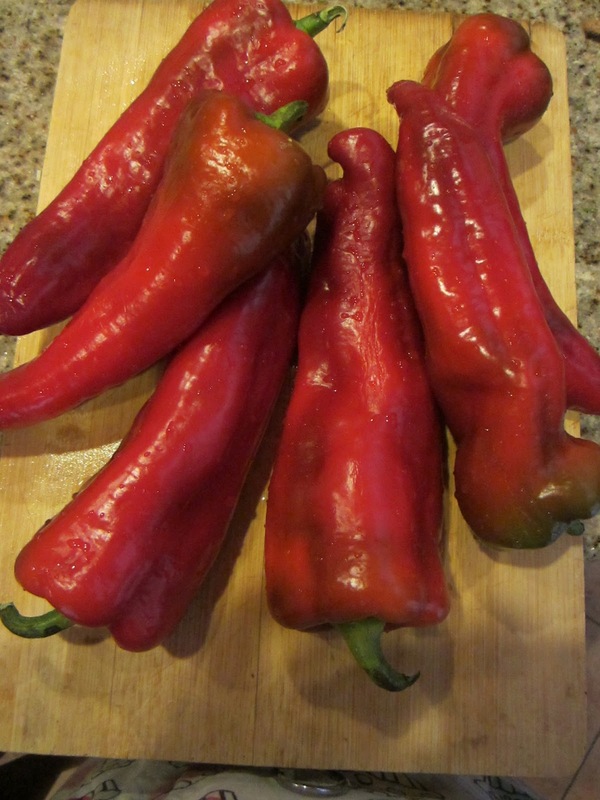 Those are large peppers! The green ones of that size we get here are promptly made into bajjis. Never tried stuffing them. Stuffed red bell paper looks very authentic and delicious. 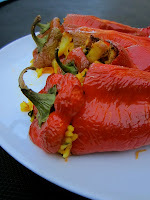 Wow the stuffed pepper looks very delicious. That looks luscious!! Vibrant and lovely!! 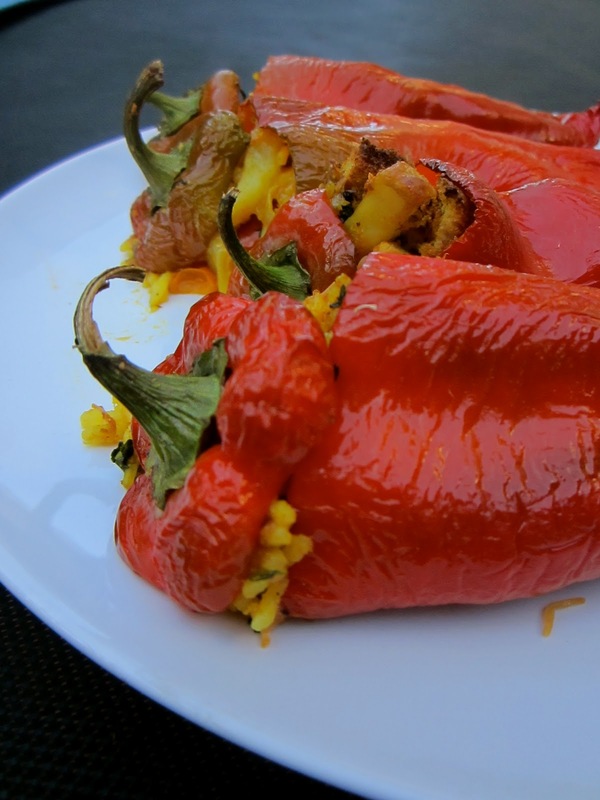 Red bell pepper is my daughter favorite, love this stuffing. I would love these, I am sure. I bet they would be good stuffed with quinoa, maybe in place of the bread. Either way, this recipe is a winner.